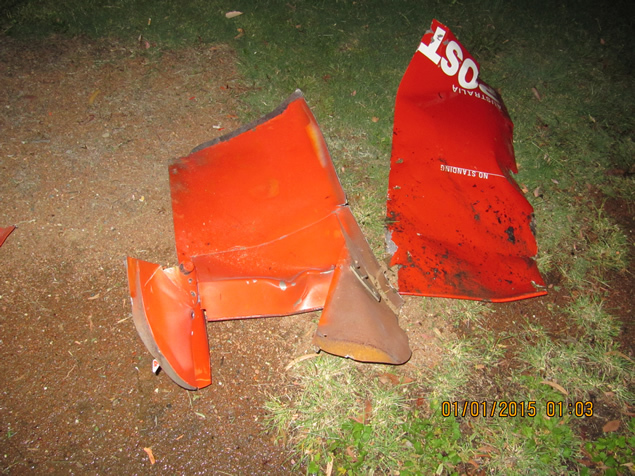 ACT Policing is investigating the property damage of an Australia Post box, destroyed in Calwell during the early hours of Thursday (January 1). About 1.45am, Tuggeranong Patrol members responded to reports by several residents of fireworks being set off in the area of Pennington Crescent, Calwell. Witnesses told police that about 1.20am, two males were seen to approach a large Australia Post box and then quickly flee the area on foot. Moments later the post box was destroyed by an internal explosion. The force of the explosion tore through the metal post box and scattered metal debris over a 10 metre radius. Intelligence and Crime Reduction Acting Superintendent Melissa Bushby said the incident was reckless and could have resulted in serious injury. “It’s fortunate that that no one was hurt and the offenders didn’t become the victims of their own irresponsible prank,” A/Superintendent Bushby said. The offenders were both described as being males of African appearance, about 198cm (6’6”) tall, of slim build, of a dark complexion and aged in their 20s. One male was wearing a black hooded jumper and carrying a back pack and the other was wearing a grey hooded jumper. Police are urging anyone who may have witnessed the incident or any suspicious activity in the Calwell area around 1.20am on New Year’s night to contact Crime Stoppers on 1800 333 000, or via www.act.crimestoppers.com.au. Information can be provided anonymously. This scale of damage wasn’t caused by “fireworks”. Given the description of the suspects and the presence of a backpack I am surprised this incident was not described as an act of terror. Have the police arrested the suspects yet?